Colorado is undoubtedly at the center of U.S. controversy about oil and gas development and in Tisha's previous role as President & CEO of COGA, she stood at the cross-roads. A geologist and environmental scientist with a history of environmental activism, Tisha represented oil and gas interests in Colorado for the last 5 years. 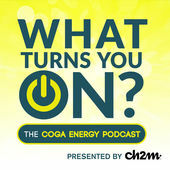 Listen in on how Tisha brought an unorthodox, innovative style to community engagement in the second episode of COGA's podcast, "What Turns You On".